Casa Italiana Sociocultural Center | EVENTS | Ciao Washington! 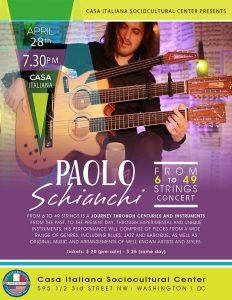 Paolo Schianchi is an extraordinary musician and performer, who is able to master all the main varieties of the guitar starting from the Renaissance lute, up to experimental instruments that he personally designed and built. “From 6 to 49 strings” will celebrate the guitar, its history, its most beloved varieties, the beauty of its repertoire, and it will capture the audience’s attention in the end with the showcase of a mesmerizing unique guitar.